The Financial Wellness Calculator, a tool that helps low-income residents achieve financial stability by connecting them to city financial wellness services in their workplace. Check out the tool. As New Mexico’s largest city, the City of Albuquerque is working to increase opportunities for economic development and social mobility for all residents. 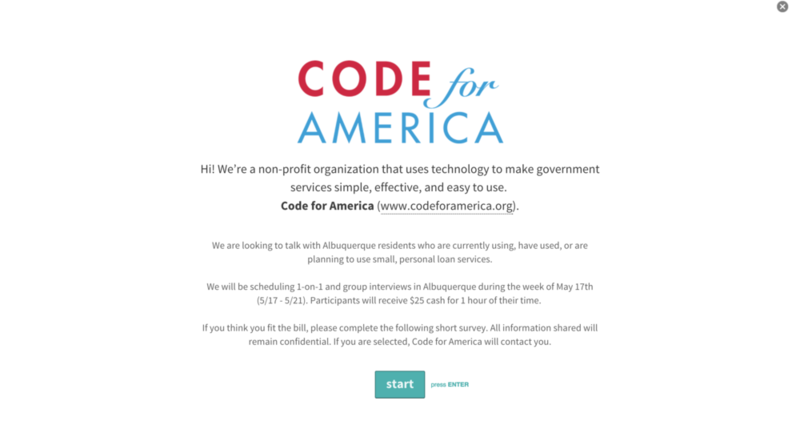 Code for America partnered with the Albuquerque Mayor’s Office to research and build interventions addressing the barriers that residents face in accessing critical information, services, and employment opportunities. I collaborated cross-functionally to lead user research for the Albuquerque Fellowship Team. 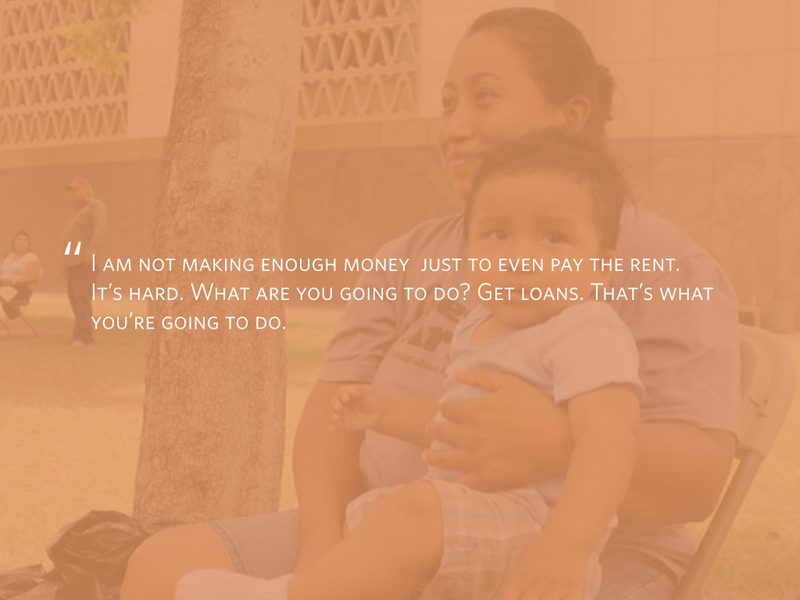 Our team worked with the City of Albuquerque Mayor's Office to understand the needs of low-income Albuquerque residents, many of whom are financially unstable and are often saddled with high-interest payday loans. We wanted to shift behavior and help residents save money, think about their futures and achieve upward mobility. We spoke with Albuquerque residents at all levels of the community. Our central question was: What are the factors precenting residents from gaining skills and achieving socio-economic mobility? Mental model of a Albuquerque resident who is stuck in a predatory loan debt trap. Emotional spectrum map drawn during interview with participant. First week insights from Albuquerque government residency. Affinity diagram of insights sorted into key opportunity areas. An interview exercise to understand where residents go for help. Using open city data and census, our interaction designer and developer built some useful maps to help us understand the distribution of different financial products / services in Albuquerque. We learned that predatory loan services often outweigh safer loan options. We translated our insights into product hypotheses and decisions. The Financial Wellness Calculator is the City of Albuquerque's new tool that helps employers connect their struggling employees to city and government services, helping them achieve financial stability. Check it out. We first had to meaningfully define financial wellness. We reached out to the Consumer Finance Protection Bureau for help. We learned that financial wellness is having financial security and freedom of choice in the present and future. Service model diagram from employer perspective. We used the CFPB's definition of financial wellness as a guiding framework. With the tool, an employer sends to an anonymous survey to their staff to better understand their financial health. The tool visualizes the survey data, illuminating problem areas and recommends city services that an employer can plug their staff into. Service model illustrating how value is distributed to all users. We've been piloting the Financial Wellness Calculator with Albuquerque employers and financial service providers. We've also been iteratively conducting rapid remote and in-person usability tests. We wanted to get actual data from employees to understand the most common financial-wellbeing needs across our piloting organizations. Our key goal was to work with Financial-wellness service providers in the community to map the employee needs to pre-existing services or create new one that employers can connect their employees to. Team Albuquerque presented it's Fellowship work in front of over 1,300 people at the Code for America Summit.